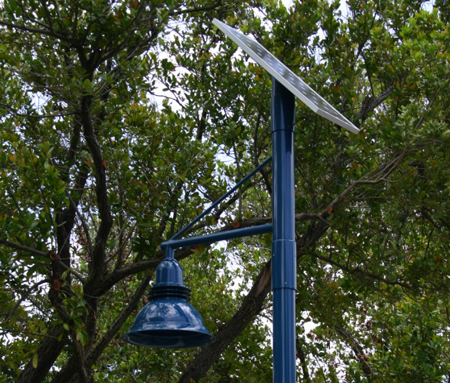 Our solar lighting solutions are custom designed to you unique specifications. Whether you need to light a parking lot, a specific area, or even a roadway, our solar powered lights are a great alternative to grid tied lighting. Our solutions offer security, navigation, and identification lighting for areas where grid tied power may be inaccessible, unreliable or too costly. Plus, you will have NO ELECTRIC BILL! Our lighting systems are off-grid that means that you will save the expense of running power to your lights AND you wont have to pay an energy bill. We space and design your solar lighting system to ensure that you get the maximum lighting output of your system. All of our engineers conduct a thorough photometry analysis to ensure optimal lighting conditions. Each system can be custom designed to your unique specifications and aesthetic needs. We offer free proposals so you know exactly what system will work on your project!